You can always depend on the workhorse, and when it comes to bad weather, don't get caught without your Wrangler Men’s Riggs Dark Brown 3W177 DB Workhorse Jacket. With water-repellent fabric, thermal lining, and plenty of pockets for storage, this heavy-duty men' ... (see full details) (see specifications) #3W177DB. You can always depend on the workhorse, and when it comes to bad weather, don't get caught without your Wrangler Men’s Riggs Dark Brown 3W177 DB Workhorse Jacket. With water-repellent fabric, thermal lining, and plenty of pockets for storage, this heavy-duty men's workwear is exactly what any working guy needs in his cold weather line up. With a 100% polyester thermal lining, you can bet this dark brown Wrangler jacket will retain your natural body heat efficiently to keep you warm at your core all day long. The exterior fabric is water-repellent so the rain will roll right off your back and not soak in and weigh you down. It's tough yet lightweight, too, made in an 8-ounce blend of 60% cotton and 40% polyester Ripstop fabric. The full front zipper is heavy duty and ready to work, just like you. With triple-stitched main seams, you'll have built-in durability that keeps up with you no matter what the day may bring. Rib-knit cuffs seal out all the dirt and debris you get into during the day and help retain your body heat for even more hard-working warmth. The rib-knit waistband keeps your Riggs Workhorse jacket fitting securely as well as adding that extra seal for warmth. With two open front reach-in pockets, one with a patented reinforcement, you can store your necessary tools and other items quickly and easily. A secure interior pocket keeps your valuables safe. The attached hood has a thermal lining and adjustable drawcord to keep it closed against the cold and wet. Since it's machine washable, keeping this men's water-resistant jacket looking as good as new is easy, and the dark brown color hides stains pretty well between washings. Built to work as hard as you do, you'll easily see why this Riggs hooded jacket is called the Workhorse. 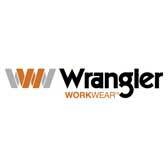 Professional grade warmth with a professional style to keep you moving, this Wrangler Men’s Riggs Dark Brown 3W177 DB Workhorse Jacket from Working Person's Store is everything you love from Wrangler and more. Order today! Wrangler Jackets: Men's Riggs Dark Brown 3W177 DB Workhorse Jacket is being added to your cart.